the equipment the initial cost is high. 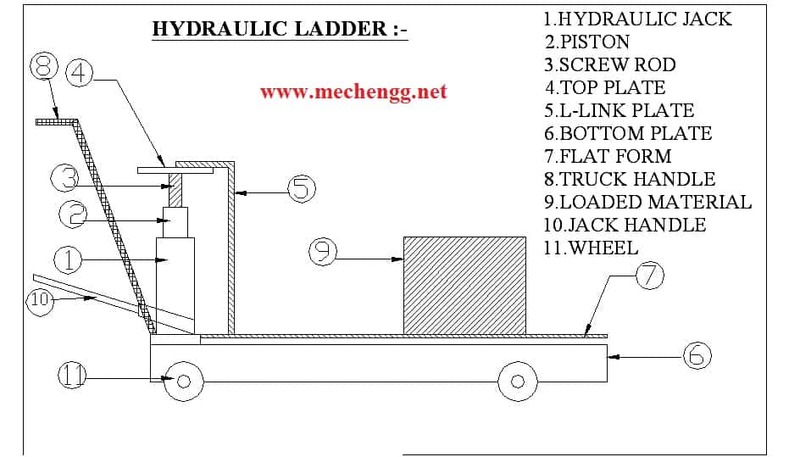 This project work titled “FABRICATION OF HYDRUALIC LADDER” has been conceived having studied the difficulty in lifting and loading the any type of materials. Our survey in the regard in several small scale industries, revealed the facts that mostly some difficult methods were adopted in lifting the material. Now the project has mainly concentrated on this difficulty, and hence a suitable device has been designed. Such that the material can be lifted from the floor land without application of any impact force. The fabrication part of it has been considered with almost case for its simplicity and economy, such that this can be accommodated as one of the essential tools on all industries. This device the hydraulic fork lift has been developed to today itself the needs of small and medium scale industries, who are normally man powered with very minimum of skilled labours. In most of the industries the materials are lifted by using high impact man power and more amount of skilled labours. In order to avoid all such disadvantages. This, hydraulic fork lift has been designed in such a way that it can be used to lift the material very smoothly without any impact force. The operation is made be simple that even an unskilled labour can handled, by just demonstrating the working of the hydraulic fork lift once. The hydraulic pump with cylinder arrangement is used to lift the high weighted material from the ground. This hydraulic fork lift is hand operated one. It is movable from one place to other place easily by a proper wheel arrangement. Material handling is a specialized activity for a modern manufacturing concern. It has been estimated that about 60-70% of the cost production is spent in material handling activities. The high pressurized oil from the hydraulic reciprocating hand operated pump is sent one end of the cylinder through the rubber hose. The oil acts on the piston and thus moves it away. Process goes on and the entire side of the cylinder is with oil and thus moving the piston to its extreme. The hydraulic single acting cylinder is used to lifting the scissors lifter frame structure from lower level to the upper level. The release liver valve is used to ladder toits original position automatically. The hydraulic oil returns back to reservoir i.e. hydraulic reciprocating oil pump. 1. Hydraulic fork lift develops greater forces than mechanical pressure and hence it is for forming, bending, and drawing and extrusion operations. 2. The hydraulic fork lift can exert its full forces at any position of the ram stroke whereas the force is maximum at the end of stroke in mechanical press. 3. The sliding action of the punch slide is uniform. 4. The length of stroke can be varied even within small ranges. 5. No noise, no vibrations and hence smooth operation. 6. Stroke length and position of stroke can be varied easily. 8. Inertia losses are less. 1. It is very much useful in all small scale industries.